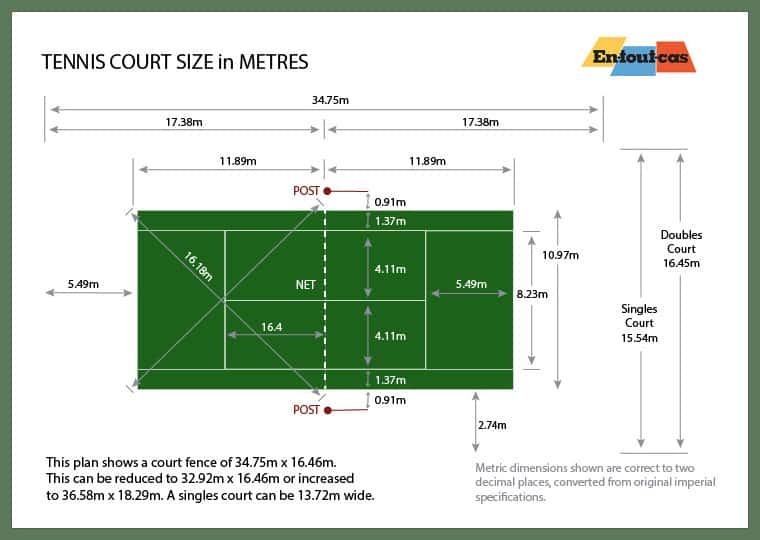 How much space do I need for a tennis court? The original dimensions were laid down in feet, but our plans show imperial and metric dimensions. It's not just the size of the actual playing area that is important. A tennis court needs plenty of space around the court too. In fret and inches, to the court size of 78 feet, you need to add an other 18 feet (six yards) behind each baseline. This means that the combined space behind the baselines almost doubles the length of the space required. In broad terms, the tennis court enclosed by a fence will occupy a space somewhere between 120 feet by 60 feet and 108 feet by 54 feet. A singles-only court can be accommodated in a space 45 feet wide. Remember too that the orientation of the court is very important - no one want to be receiving serve facing into a bright sun. Accordingly your court should be laid facing north to south, rather than east to west. Tennis court fencing plays an important part in the presentation and practicality of a tennis court. Our approach is to use our own design, elegant patented fences complement the court and make it an attractive part of the garden. There are just seven reasons why you would need planning permission for a tennis court. You’ll be aware of our commitment to quality, from the moment we visit to discuss your needs and to survey your proposed site. We’ll take care of details, such as making sure that the court will fit the area you have in mind, that it is correctly orientated relative to the sun and that it is located on stable ground. We’ll ensure that tree roots won’t be a problem, and that surface chosen will perform well in the location. As well as tennis court construction we also offer a full resurfacing, cleaning and refurbishment service for tennis courts. We build tennis courts, including synthetic grass surfaces, synthetic clay and hard courts throughout the UK. If you are thinking f investing in a tennis court for your home, please talk to us.